Omics 101: A Primer for Clinical Practice, is a CME course focused on educating the health care team that is integral in the translation of individualized medicine into patient care. Center for Individualized Medicine experts in their fields give in-depth didactics on state-of-the-art subjects in genomic medicine. Find out more details after the break. Omics 101 provides the foundation for understanding fundamental principles and application of genomics and pharmacogenomics in clinical and laboratory practice. Understand what is meant by terms like genome and exome; learn the fundamental principles of laboratory practice, including DNA sequencing, laboratory analysis, and management issues. Understand the roles and responsibilities of the genomicist as a partner in providing team-based care. Well-known experts in each field give in-depth didactics on state-of-the-art subjects in genomic medicine. Each lecture is followed by a question and answer session. Discuss the role of the genomicist in providing patient care. This enduring material is a recording of the Omics 101: A Primer for Clinical Practice (September 29, 2013) on DVD. After reviewing the course lectures on DVD, CME credit may be claimed by completion of several on-line assessment modules. Assessment modules are separated by topic area. Assessment modules may be taken two (2) times and require an 80% pass rate to claim credit. 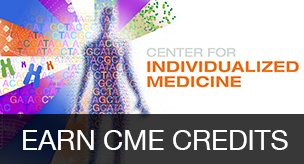 Another way to earn CME credits through the Center for Individualized Medicine is to attend our Individualizing Medicine Conference this year, October 6-8. Purchase the Omics 101 Course here.